Hazel by Allison Harris of Cluck Cluck Sew for Windham Fabrics. I already got to play with this fabric line for this quilt, and loved it then and I loved it even more getting to see what Allison did with it!! And aren't Allison's quilt patterns just so fun!!! Simply Colorful 2 by Vanessa Christensen for Moda. Now, with all those beautiful cool tones, especially the gorgeous purples, you know I am head over heels for this line!!! Must sew something with this soon! Rhonda Ruth by Elizabeth Hartman for Robert Kaufman. I love the beautiful tone on tone prints in this line, and of course, you have to love Elizabeth's fantastic patterns. So fun!!! Curiosities by Jeni Baker for Art Gallery Fabrics. I always love Jeni's bright colors and happy prints. They just make you smile when you are sewing with them and Curiosities has plenty to smile about. Ginger Snap by Heather Bailey for Free Spirit Fabrics. I love Christmas fabrics and this line has such a fun twist on the traditional Christmas colors. It really adds a contemporary feel to these Christmas designs. Tiger Lily by Heather Ross for Windham Fabrics. I loved the colors in this line and the details in the prints are absolutely adorable!! 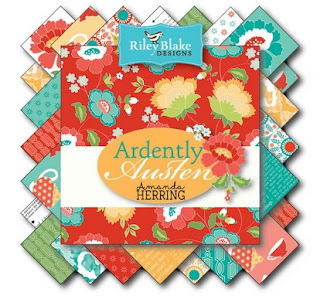 Ardently Austen by Amanda Herring for Riley Blake Designs. This one isn't out for a while so it wasn't showing in a booth but Amanda shared it in the schoolhouse and oh, so loving it!!! The text prints actually have quotes from Amanda's favorite parts of Jane Austen's novels like Mr. Darcy's proposal and Captain Wentworth's letter to Anne. Oh yes, I think I might be hoarding those text prints!!! Pie Making Day by Brenda Ratliff for RJR Fabrics. I have had my eye on these yummy sherbet tones ever since I saw a sneak peak of them. They are just so happy!! I was lucky enough to score a bundle at Sample Spree so I am sure I will be making with this soon. Drawn, by Angela Walters for Robert Kaufman. I should have zoomed out here so you could see some of the fabrics in the line, but I was blown away by this stunning example of Angela's quilting!! For her fabric, think this, but drawn on the fabric. Gorgeous!!! Eden by Tula Pink for Free Spirit Fabrics. I am always such a fan of Tula's lines!! I especially love those chevron polka dot prints on the front of the fabric rolls. And I am so excited about her True Colors line as well!!! Always fantastic Tula!!! Prairie by Corey Yoder for Moda. This is Corey's first line with Moda and she knocked it out of the ball park. And I am so loving her quilt patterns!!! Those stars!!!! Sketchbook by Sharon Holland for Art Gallery Fabrics. I was drawn to the gorgeous soft tones and delicate designs. So beautiful! Dot Dot Dash by Me and My Sister Designs for Moda. I always love the happy bright colors in these ladies designs and this time, it is all polka-dots and stripes!!! I just don't think I can say it enough, I love Polka dots!! And that is a quick peek at some of the new collections coming out in the next 6 months. Like I said, there were so many more amazing ones but we had to end this post at some time. I can't wait for the next 6 months of fabric!!! Which fabric lines are you most excited about??? I will be back tomorrow with a final Market Wrap-up and a Surprise!!! See ya then. Your pictures are so amazing, thank you so much for sharing with us. I liked the dot dot dash one!! This is the first I've heard of the Ardently Austen line and oh my gosh, I'm so excited! I can't wait to get my hands on those texts prints! I am looking forward to the Ardently Austn line. What could be better than Jane Austen quotes on fabric. lots and lots to tempt us here! I really like Hazel and Prairie!!! I'm drooling over those two! Can't wait for the Ardently Austen line! My favorite author and fabric too! However, all of the fabric lines are gorgeous! Thanks for the recap.